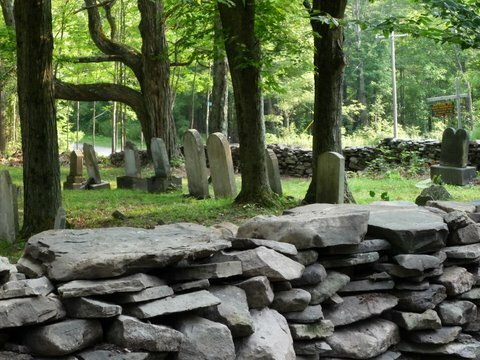 The Baptist Church Burying Ground is on West Mountain, at the corner of Peasley and Wood Roads surrounded by stone wall fence. Owner (1984): Paul Benson, RFD, Berne, NY, 12023. Surrounded by Partridge Ridge State Wildlife Management Area. 140 by 180 feet. Fenced. Burials took place in the Baptist Church Cemetery for over a century. The earliest readable death date is 1800 and the most recent was in 1929. Among the more than a hundred tombstones are the names: Allen, Bouton, Miller, Peasley, Rhodes, Ryan, Sherman, Shultes, St. John, Tubbs, Vroman, West, Wood, and Young. Seven Revolutionary War soldiers and a daughter of a Lord Mayor of London are buried here. The cemetery is in fair condition with some fallen stones. There is some evidence of vandalism. It is mowed regularly by the Town. In the summer of 2009 the Berne Summer Youth Program repaired the stone wall. There is a list of Burials at the Berne Town Hall.